Roll, Roll, Roll Your Oats.. 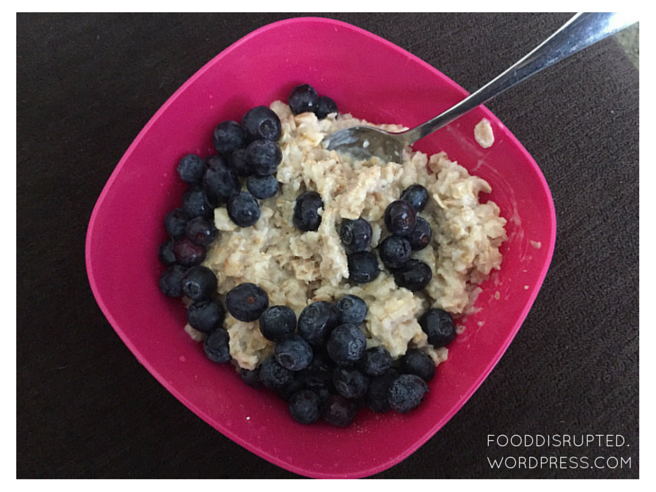 I wanted to make a quick post about my rediscovery of oats for breakfast. I have been looking for a low-fat, low-cholesterol (I can get carried away with the scrambled eggs), low-sugar alternative for breakfast that I won’t get sick of. I also wanted something with some protein in it. The last couple of weeks I’ve been making a bowl of cooked rolled oats (no… I don’t roll them myself. I’m not that special) with fresh fruit for breakfast and it hits the spot everytime! I have found lately too that I crave the oats in the morning. especially when I go for my walks. What does your breakfast routine consist of? What other ways have you cooked or prepared rolled oats? I have also thought about soaking them overnight in rice milk.. but maybe I will save that for the summer, as I prefer having warm breakfasts in the winter. Anyway. Happy oating.. I mean eating 🙂 Have a great day! So this morning I woke up a little later than usual. Fen and I were up late finishing a movie about Bonnie and Clyde (very interesting), so instead of waking around 7 I woke around 8 instead. I started to get ready for my walk, but as soon as I got out of bed I knew that I was going to have a tough workout. My body felt very lethargic and sluggish. I am not sure if it was due to falling asleep after midnight or if it was from the abundance of carbs I had for dinner (we made spaghetti with garlic bread. It was amazingly yummy). I also wondered if it was because I ate too much at dinner. I certainly didn’t binge, but I know I ate a little too much pasta and went a little crazy with the garlic bread. That’s OK – I have to recognize my mistake, forgive myself, vow to do better next time, and move on. I dressed and washed up, did some dishes, fed, medicated, and walked the dog, then laced up my sneakers and hit the pavement. I planned to do the full 3.5-ish mile route that I had done Monday. I started off with a decent start, feeling still pretty tired but pumped and motivated. It was mostly my legs that felt super tired, now that I think about it, but I kept pushing myself forward and focused on the music in my ears. There’s a portion of this route that is about 0.25 miles long, without any crosswalks or anything else to keep me from having to stop or look for traffic. This is the portion I ran on Monday and today I ran it again, except it was harder today than it was on Monday. After that section I kept walking, but my legs started to feel like jello! I was starting to get annoyed with myself at this point.. but still, I pushed onward. On the way back I had to stop and admire a creek I walk by on this route. It’s always super pretty to look at, I enjoy hearing the sound of rushing water, and it’s neat to see how the water level will rise when storms blow in. Looking up the creek. Isn’t it such a pretty view? I should try walking on the other side sometime. About 3/4 of the way through the entire walk I realized I was getting a blister on my right heel.. or at least that’s what it felt like. I stopped and relaced my shoes, hoping to prevent my foot from slipping around so much, but I honestly think I need better, thicker socks. So how exactly could that be? I honestly have no idea. But apparently even though I felt like I was dragging my legs and feet behind me I was actually moving faster than I have before. Another sign of improvement! I’ll take it!!! Since my walk this morning my left leg has been bugging the crap out of me, I think because the calf muscle is just tired, so I will need to rest it and maybe massage it a little later. As for the rest of the day? Fen is off today and tomorrow from work so we’ll be watching some (horror?) movies and I’ll be checking things off the to-do list. I hope you all have a Happy Hump Day! Hi all. I have normally been posting each day, but figured I would give myself a break over the weekend. I also gave myself a break from walking. Believe it or not, I actually didn’t want to take a break from walking, but it Fen kept telling me to rest so I finally did.. and I felt much better come Monday morning. I’ve decided to set myself some goals and every few weeks I may add to it. I don’t want to overwhelm myself, so I am going to set very small goals. I will primarily focus on the fitness routine each week and setting goals for that, but will also add some goals here and there for other parts of my life, namely food. I am going to try a new fitness routine and see how it works for me. Each Monday, Wednesday, and Friday I will go for my 3-3.5 mile loop and will walk most of it. Each week I will try to run a portion of it, a very small portion to start with, and will gradually increase the distance so that I start walking less and running more. I have sustained back and knee issues in the past and don’t want to try and advance too quickly. On Tuesdays, Thursdays, and Saturdays I will be doing an hour of yoga instead. Each day of the week I walk the dog 2-3 times per day, so that still gets me up and moving, but on Sundays I will take a break from everything. Fen and I talked briefly about eventually buying a gym membership. I want to get into cycling and maybe some weight lifting after time, but that can all happen down the road. I am not too concerned about it right now. Yesterday morning I walked with Fen to work and back, covering 3.5 miles, and running about 0.25 miles. Now.. I recognize that running 0.25 miles is nothing for some, but it’s a huge accomplishment for me. Last week I was able to run about a neighborhood block before I felt exhausted. Today it was much further. So this week I will be sticking with that running distance and next week I will push it a little further. As for a dietary goal, this week I have challenged myself to drink about 6-7 glasses of water a day. I think for my height and body weight I should be consuming closer to 7 glasses, but I would be happy with 6 to start off with. I think on average I only drink about 4-5 which is clearly not enough. To help me accomplish this I will be using a tracker that is built into my FitBit app on my phone. I failed miserably at this yesterday, only clocking about the same 4-5 glasses, but plan to improve on it today. I am not sure how long it will take me to start drinking 6-7 glasses of water each day without having to remind myself, and I do not plan to put any pressure on myself to complete this goal in the next week. It’s Been Over A Week! I have had two (small) binges during the week, one yesterday and one on Thursday (or was it Wednesday..?). I have discovered that when I go for long walks in the morning I start to crave sugar in the afternoon and find myself snacking uncontrollably. I have had to force myself to stop each time, but it was still a challenge.. though not as difficult. As for overeating, I’ve only done it a few times (maybe 3-4?) this past week, which is remarkable, because it’s usually during every meal. I’ve discovered that by a) exercising for a good hour in the morning, b) not overeating, and c) working hard to control the binges, I have started to recognize some of my hunger cues and am starting to remember again what true hunger feels like. I have also improved a bit on being able to differentiate between being hungry and actually being thirsty. As for drinking water…. I still need some major improvement in that department. I am trying. I think part of my problem is I am cold 24/7 here in the winter (think of it as a damp cold with all the humidity we get from being on the coast) and the last thing I want to do is drink a glass of cold anything. Perhaps I should start drinking lots of tea again. I was on a bit of a tea kick last year around the holidays and loved it! Especially having green tea in the afternoons. I’ve started wearing my FitBit again (if you are on there add me as a friend and we can compete in challenges with each other 🙂 ) during the day to track my steps and I have also been wearing it at night to monitor my sleep. I’ve forgotten how much I enjoyed using that device. Maybe later this year I will buy myself the wristband. I have the FitBit One that clips onto your waistband and I swear it’s going to pop out one day and I will lose it forever. I like using the FitBit though because it also tracks the number of floors you climb each day (which is great, because I live on a hill, surrounded by hills) and also reports back the number of calories you’ve burned each day. I don’t focus too hard on that number, but use it to guide me when I select meals each day. Though I have been going for some long walks in the morning (~3 miles, ~1 hour), I have also tried to switch them into intervals of walking and running. The first day I tried this was Thursday and I did pretty good. I actually just went for two small sprints and my legs felt a little tired, but nothing too bad. On Friday I tried switching between walking and running and ended up having to stop because my shins started to hurt again. I am not sure if it was the running that did it or the running down a hill that did it. I am going to let my legs rest for a couple days and then try the intervals one more time on a flat (maybe softer.. so less impact?) surface and see how I do. I have to remember to be patient with myself though. That’s often the hardest part for me. Earlier in the week I forgot to mention that I won a book in a contest on GoodReads! It’s called New Life, No Instructions: A Memoir and is written by Gail Caldwell. I am excited to read this book, because I think it will give me some insight and hope into new beginnings in life, especially those that come unexpectedly, with little warning, and no instructions. For those who know me personally, you’ll probably know what I’m referring to. So.. yesterday and today were pretty interesting as far as exercising went. Both days I covered about 3 miles roundtrip and felt pretty good afterward, but could still feel my body craving more. On Thursday I accompanied Fen on his walk to work. On the way to his work I sprinted a couple times to see how my legs, knees, and back would respond. I was expecting one of the three to start hurting due to previous injuries I’ve had, but I felt fine afterward, except for a little burn in my calves. I walked the rest of the way home, deciding not to push myself too hard and just enjoy being outside and active. Today I dropped Fen off, came home, grabbed my earbuds, and headed back out. I took the same path and for about a mile of it I walked and ran in intervals. I would essentially walk for one street block, then run the next street block, then walk, etc. I found that after the third or fourth interval of running I was in a lot of pain. My shins started to feel like they were tearing (yet again) and my calves started to ache. So I walked the rest of the way there and back home again. By the time I got home I was pretty disappointed. I recognize that I won’t go from couch to 5K in a week, but I am bummed that I am having so much trouble running! I don’t understand why my legs are having such a difficult time either. My legs have always been strong and I have been a hiker for years. I am starting to suspect that I may need to shed some weight before I can start running again. The other problem is there are hills everywhere in this town and it’s pretty difficult to find some flat terrain to start out on. I am thinking about looking for a track, maybe at the local high school, that I can use after hours to practice those intervals on. We’ll see. Part of my frustration too comes from the fact that even though I can walk 3 miles up and down hill, it’s not enough for me. I come home and feel like I haven’t even burned through half of the stress from the previous day. I need more cardio and a more intense workout. I have considered a gym membership and maybe trying something like Zumba for the time being to help me get the cardio I am craving and also help me tone up and shed some of the weight. On the way home today, I was thinking about my body and I had to remind myself that I need to be more patient. I really am not a patient person. I don’t think I ever have been. I always want to go from A-Z faster than is practical and then I get frustrated when I can’t.. but I really do need to be patient with myself, celebrate the small victories (I did after all cover 6 miles in the last two days, not to mention all of the other walking I’ve done), and set reasonable goals along the way. While I was thinking about being patient, I was also thinking about my sister, who has always been a (natural) runner.. and I remembered something she told me a long time ago: You have to learn to walk before you can run. Now.. when she told me this, she was talking about something unrelated to exercising (I think it was my schoolwork), but it’s something I’ve held onto all these years and remind myself of often. So yes. Perhaps my body is telling me to become an even stronger walker before I can become a runner. The last week or so I have spent some time thinking about some of the stereotypes and perhaps misunderstandings that surround eating disorders. I think part of these thoughts have arisen from my own issues in admitting to others that I have an eating disorder. First, let me say that it’s extremely weird to say that out loud, or even in my own head. It’s weird to think that I have an eating disorder, or to even type it here. Although I have never been officially diagnosed, nor have I ever sought diagnosis, I do exhibit all predefined symptoms of Binge Eating Disorder except for purging. Regardless, whether I have a clinical diagnosis or not, I do know from my own patterned behavior that my eating is disordered. I remember the first time I thought to myself, “I might actually have an eating disorder”, I paused in reflection, only to look in the mirror and think to myself how absurd that sounds because I am not underweight, I am overweight. I suppose I always assumed that having an eating disorder meant you were malnourished and underweight, but I recognize now that isn’t always the case. In fact, in recent years a variety of different eating disorders have been newly recognized, to include Orthorexia and Avoidant/Restrictive Food Intake Disorder (ARFID. This long-held assumption made it difficult for me to tell others about my issues and extremely difficult for me to even admit it publicly, through this blog, because I figured no one would believe me or take me seriously. In talking to others about my experience and eating disorders in general, I also started to realize that some people tend to forget that even though it is an eating disorder it is still associated with mental health. In my case, food has become an addiction and a vice. I am addicted to it, because I use it to make me feel better about different things in my life. I am also addicted (in a different way, I think… and that will have to be addressed in a separate post) to certain foods, namely those high in sugar. Addiction to food is a tricky thing. If one is addicted to cigarettes, the ultimate goal is to quit smoking them. If you are addicted to alcohol or drugs, the ultimate goal is to quit using those substances. We can’t quit eating food though. It is a necessity. And I often find myself wishing I didn’t have to eat or think about or deal with food, because it would make things so much easier to manage. So instead of quitting the substance I am addicted to, I instead will have to find a way to live with it in some capacity that is healthy and not damaging to me.. and that is what I need to figure out how to do.